Sleep Disorders - Arizona Pulmonary Specialists, Ltd.
Sleep apnea is a very common problem affecting as many as 10% of the adult population in the United States. Patients complain of snoring, fatigue and sleepiness. As the disease progresses, leg and abdominal swelling may occur. Sleep apnea is a breathing problem that develops during sleep when the upper airway is temporarily obstructed or blocked. This occurs when the tongue slides backwards. Sleep apnea is more common in patients that are overweight. Other risk factors include a family history, large tonsils, a weak chin and certain other medical problems. The disease is exacerbated by drinking alcohol, taking sedatives, weight gain and sleeping on your back. 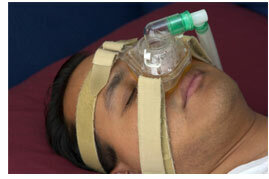 Sleep apnea is diagnosed by a sleep test (polysomnography). This test is performed in a sleep laboratory. You spend one night attached to many monitoring devices. People are often concerned that they will not be able to sleep during the tests. This is rarely a problem. During your sleep study, the technician will be recording brain waves, breathing effort, airflow, leg movement and oxygen saturation. If you meet the criteria for sleep apnea, the technician may try different pressures of CPAP (a special mask that blows air into your airway). This helps determine the optimal pressure to treat your problem. The treatment of sleep apnea usually involves CPAP (a special nose or face mask attached to a small air compressor with a computer chip). However, there are other treatments besides CPAP such as dental devices for milder disease, surgery or tracheostomy. The lung doctors at Arizona Pulmonary Specialists are experts in the diagnosis and treatment of sleep apnea. We have several physicians that specialize in complex sleep apnea. Our team of doctors, nurses and respiratory therapists will work with you to ensure that you understand your diagnosis and treatments.